For those of our customers who ask exactly what is wall tie failure, allow us to explain in more detail. In the event that the wall ties fail to perform these primary functions then wall tie failure is deemed to have occurred. So what causes cavity tie failure? Failure of the cavity wall tie installation can be the result of a building design fault or of a deficient construction process. Perhaps there were either insufficient ties built into the wall during construction or perhaps ties used were too short for the cavity width. On the other hand wall tie failures may occur through natural decay as the building ages. 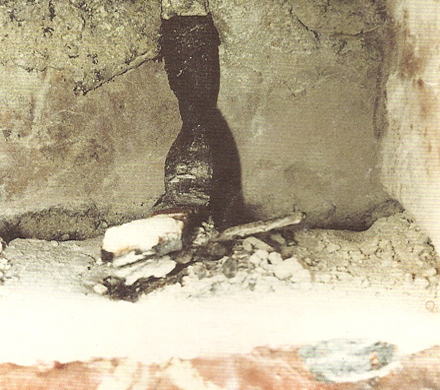 Chemical or moisture changes in the mortar that surrounds the tie becomes destructive, breaking down protective layers and allowing the onset of wall tie corrosion. It is hardly surprising that rusting tie irons lose the capacity to perform their primary functions. What are the signs of failing wall ties? Where the density of working wall ties is inadequate there may be little obvious sign that the walls are not securely tied. Look out for a bulging wall surfaces. Bulges in walls can be most visible around window openings, at gable apexes and at ceiling joist levels. Such movement is a reliable sign that all is not well and that further tie restraint may be necessary. Where vertical twist wall ties or other heavy duty tie irons have been used one may notice a series of horizontal cracks at regular intervals. This is a classic sign of wall tie failure caused by corrosion of the cavity ties. Iron oxide layers cause corroding ties to expand within the mortar bed joints. The accumulative force created by the expansion process along a row of ties literally lifts the masonry and separates the wall into unrestrained panels. 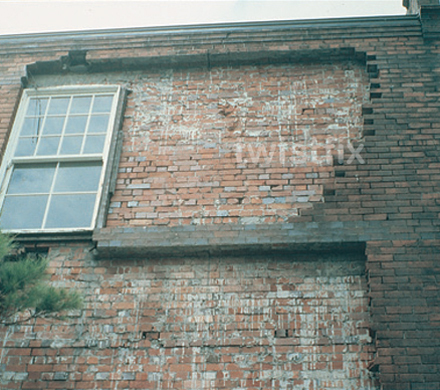 As there is less brickwork to lift at higher levels the pattern of cracking is usually worse near the top of the wall. 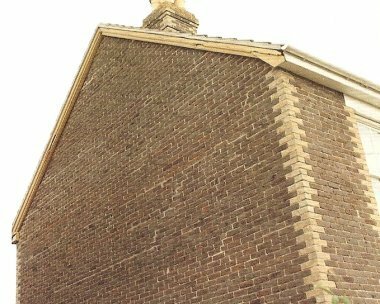 Many surveyors, specialists and general builders are able to use a scope to look into the wall to view the condition of the wall ties or to remove a few bricks for a more detailed inspection. BRE Digest 401 gives recommended minimum action for corroding wall ties based on the level of corrosion. This includes regular monitoring if visual inspection reveals a breakdown of the protective zinc layer, the scheduling of repairs if the ties exhibit large areas of red rust and the immediate replacement of ties if the existing tie irons have a build-up of iron oxide layers or an erosion of steel cross section. How do I remedy wall tie failure? There are a variety of replacement wall tie systems on the market that are designed for retrofit application. When selecting a tie type it is important to consider not only the primary functions of a wall tie, which should combine axial strength with planar flexibility, but also other functional requirements such; a mechanism to prevent passage of water, durability and ease of use. 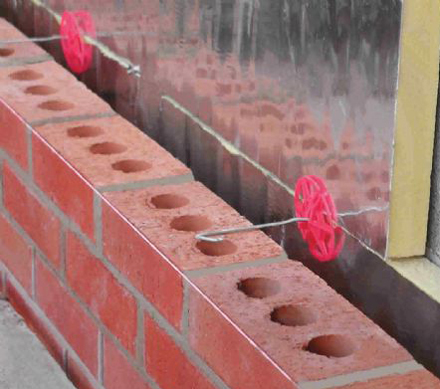 If both walls of the cavity have been constructed from masonry that is more than 90mm thick then the new wall ties should be installed at spacings of 900mm x 450mm ( 2.5 ties per metre2), with additional ties at open reveals. 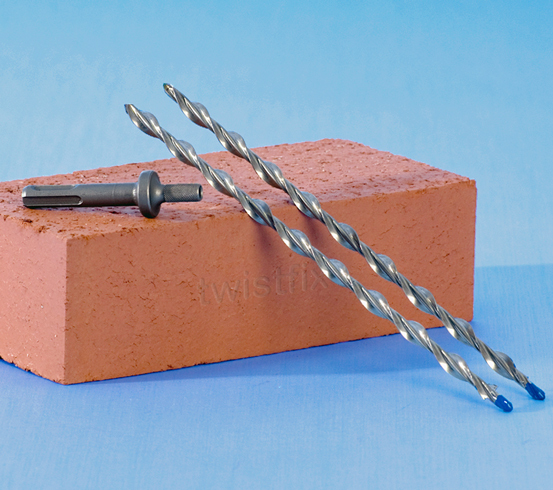 Where vertical twist wall ties or other heavy duty tie irons have been used and they have potential to weaken the wall via expansion then these ties should be removed from the wall or isolated from the masonry using an isolation sleeve system. Twistfix supplies a comprehensive range of replacement wall ties and so if you are not sure what it is your looking for or how many wall ties you are going to require then do not hesitate to call a member of our team. All team members have had vast amounts of experience within the building, construction, refurbishment and remedial industries. 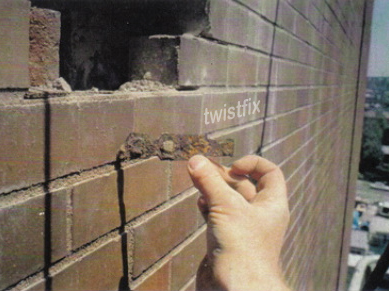 For more information on wall tie failure please contact us on 0845 123 6006 or alternatively you can email us on sales@twistfix.co.uk.